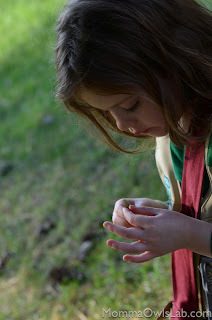 The weather remains balmy for this Thursday's activity so we are heading outdoors for a Seed Hunt! In the northern part of the US, September and October are ideal times to do a seed hunt and it can be done in a city park, suburban backyard or a large plot of land in the country. If, however, you don't have access to a natural space or the weather or time of year is prohibitive. you could use your kitchen as the hunt location - spices, fruits and vegetables and even house plants could provide you with the seeds. Remember to emphasize (and re-emphasize!) that the seeds should not be eaten as some may be poisonous. The process here is pretty simple: take a walk and observe! Once you find a seed or fruit that looks promising, carefully remove it (you may want gardening gloves for this part) and place it in one of the sample bags. We didn't use our science journals today, instead we chose to document what we were doing by using photography. My older one has her own little camera (an Argus Bean - not great pictures but indestructible) so she took pictures of all the plants from which we took seeds. Once the sample is collected and the plant is documented, identify the plant or tree and write that on the ID slip that goes into the bag. Here Sydney is counting the number of needles on the pine "leaf" - 5 needles is a white pine. Maya working hard at identifying the plants. Overall, we collected about 15 specimens of seeds. We're going to keep them in their sample bags for the week and then use them for next week's activity on seed dispersal. In the northern part of the U.S., the fall is a great time to collect seeds. Most seeds consist of three parts: a plant embryo, some form of nutrients to sustain the embryo until it can produce its own energy (often a cotyledon), and a seed coat. A simplified model of a seed is a Peanut M&M. Take a peanut M&M and bite it in half so that they can see the layers inside. The candy coating is like the seed coat, the chocolate is like the nutrients and the peanut is the plant embryo. This is very simplified, and a little ironic as the peanut is a seed in and of itself, but it may be useful for your child to get a feel for the parts of a seed on a larger model. Seeds themselves range dramatically in size from the tiny, dust-like seeds of an orchid to some that way multiple kilograms. One thing that you can do with your child once your seeds are collected is to sort the seeds based on size, which will give them a chance to practice measuring. Make sure to clarify the difference between seeds, fruits and nuts. A fruit is a structure that carries the seeds; I've heard it described as a "seed suitcase". Nuts are often seeds with a hardened fruit exterior (think about a sunflower seed that you have to open the case, which is the hardened fruit, in order to get to the seed inside). As a literature connection, we enjoyed both "The Grand Old Tree" by Mary Newell DePalma and "From Seed to Plant" by Gail Gibbons this week in preparation for the activity. You can also follow up this activity with our seed dispersal activity and learn about how the seeds you found move from one place to another. Visit the science process skills page for more information on the different skills. I hope you enjoy this activity! If you try it, please leave me a comment to let me know how it goes!